The potential bases would be used for the maintenance of weapons and repair of military hardware. 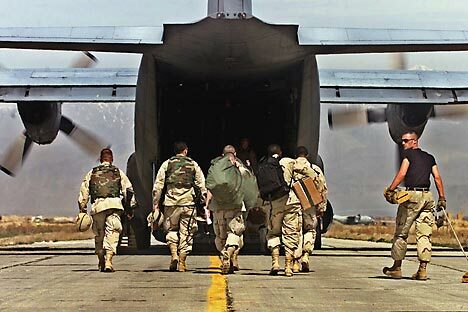 Russian Defence Ministry officials and NATO representatives will soon discuss the possibility of Russia establishing new bases in Afghanistan for the repairing of military hardware. “We will look into various options of creating repair bases on Afghan territory,” the head of the Defence Ministry’s department of international cooperation, Sergey Koshelev, told the press. He added that the maintenance of weapons and military hardware in Afghanistan remains a top priority, as any instability in the country would affect Russia’s own security, as well as the security of other European nations. Russian NATO envoy Aleksandr Grushko also said that Moscow was not excluding the possibility of broader cooperation with the military bloc. In particular, Russia could offer to enlarge the transport corridor to Afghanistan, so that the country’s own forces could continue to receive supplies from Western allies after coalition troops leave Afghanistan in 2014. The top Russian MP for defence said in press comments that Moscow saw stabilisation in Afghanistan as a main priority: “In any case this [Russia-NATO cooperation] is a positive moment. The coalition was breaking there for 13 years. We remember very well the situation our troops found themselves in at the Afghanistan-Tajikistan border. This is why the stabilization in Afghanistan is very important for us,” Sergey Zhigarev told RSN radio. The complete withdrawal of International Security Assistance Force from Afghanistan is scheduled for 2015. Then-US Defence Secretary Leon Panetta said in a recent statement that Afghan authorities are already providing security across three-quarters of the country’s territory. Panetta added, however, that the withdrawal of military forces did not mean that the US was leaving Afghanistan completely, and promised aid and training to the country’s government and military forces. Over the past several years, the Pentagon has been buying Russian weapons, including helicopters for Afghan military forces, despite criticism from some US politicians. Russia has also agreed to open a NATO logistics base on its territory to simplify cargo deliveries from Western Europe. Russian officials have repeatedly denied that Moscow is considering resuming its military presence in Afghanistan. First published in the RT.com.